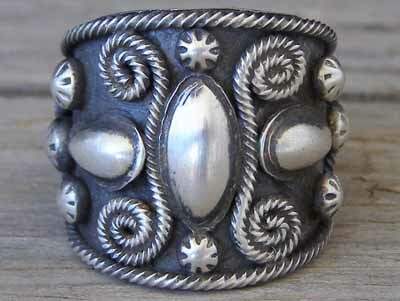 This beautifully worked ring by Navajo silversmith Richard Jim is a study in light and dark contrast and rich texture. The heavily oxidized background makes the various appliqueés stand out nicely while providing rich texture through a combination of raindrops, twist wire and the central domed long oval in front. The ring tapers to a narrower shank in back to make for a comfortable fit.